Hi friends! I am back from a wonderful week visiting my son in Missouri. 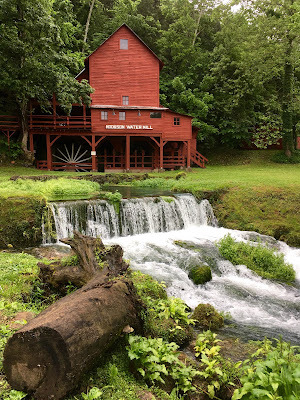 It was my first time there, and I was awed at the beauty of the Ozark Mountains. Scroll down if you'd like to see a few pics! 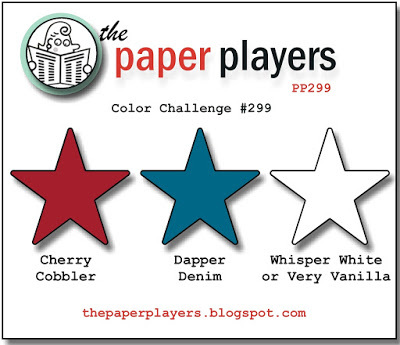 My sweet friend LeAnne is hostess this week at The Paper Players, and she has a patriotic color combo for us. I thought these colors would also work well for a nautical theme, and since I needed to make an anniversary card for my DH, that's the route I went. I still have oodles of products left from my 2015 Simon Says Stamp card kits, including the patterned paper I used today. The Sailing stamp set also came in the kit. I stamped it in Memento Tuxedo Black ink and colored with Copic Markers. I love this little sailboat! I used the sketch at Mojo Monday and rotated it 180 degrees. At Simon Says Stamp, the Wednesday Challenge is "For a Guy". And here are a few promised picks from my Missouri trip. We went to so many beautiful places, it was hard just to pick a few! This one was taken at Grand Gulf State Park (the little Grand Canyon), in Thayer, MO. Hodgson Water Mill in Ozark County, MO. Mammoth Spring State Park in Mammoth Spring, AK. Last but not least, my handsome grand-dog Brody! Hi Sandy . . . I was missing your posts! So glad you were away. The photos are beautiful. I love anything patriotic so this card is perfect. Love your nautical themed card! Sandy your card is incredible! Loved your gorgeous photos too! Your card is as sweet as can be.....I love those waves! And your pix from the trip are wonderful! Glad you had a good time! Looks like such a FUN trip! Glad you had a good time. I think that sail boat is just the cutest, and I love how it's sitting on the waves.Those wood stars are so fun too! Awesome card Sandy - this is the best take on this sketch I've seen! The sail boat on the waves is adorable. So glad you enjoyed your week's break too - the photos are great, it looks like a lovely corner of the world. Sandy, Brody is so gorgeous! I love your card. I don't use this set anywhere near as often as I should and your placement of the ship amongst the waves is genius! What gorgeous photos from your trip, too. You already know I LOVE this little sailboat, especially colored the way you did...such great shading! Great sentiment and those little wooden stars...SO cute! AND finally some pictures of your trip...it looks like it was beautiful weather too! Wonderful that you were able to get away and relax! This is such a great card, Sandy! Such a sweet little sailboat and, LeAnne is right your shading is amazing! Love the fussy-cut waves too. So glad you got to spend time with your son and your pictures are beautiful! L like the background and the sailboat! Superb! I hope my entry for PP299 does not look to much like yours. This is so beautiful! Love that sailboat and waves. Thanks for playing along with Mojo Monday! Fabulous card, love how well those stamps work together.